Once upon a time in Wisconsin, business and labor worked together to grow our state’s economy and create an unprecedented standard of living for working families. Companies enjoyed rising profits while paying their employees a living wage. Workers could afford to buy the goods and services their neighbors produced. This created more demand and with it, a climate for more investment and job creation. 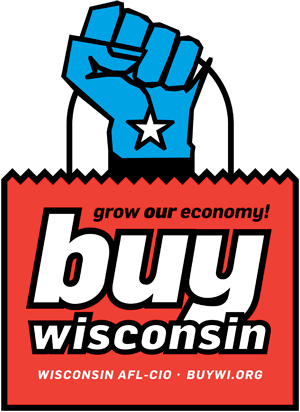 This virtuous circle, in which middle class consumer spending fuels growth and prosperity, is the idea behind Buy Wisconsin. When we choose to spend our money on Wisconsin-made products, we help build a healthier economy for everyone. Every dollar we spend on locally-made goods and services flows from one person to another. It gets spent again—not just once, but many times. This means even small increases in spending by consumers or the government lead to much larger increases in economic output. Economists call this the multiplier effect. As a consumer in today’s global economy, you face choices everyday. Those choices have consequences. Sometimes you can save a few pennies by buying products produced in a low-wage factory half a world away. But in the long run, it costs you more than you save. Wouldn’t you rather put your money to work in Wisconsin, building our local economy and protecting and creating jobs in our communities? Next time you have a buying decision to make, take a moment to think about the kind of Wisconsin you want to live in. Do you want your hard-earned dollars to leave the state and go into the coffers of some multi-national corporation, or would you rather support your neighbors and invest in your community? For working families, the smart choice is to Buy Wisconsin.